Already it is April — the name of the month that Edith Holden says is derived from the Greek word for ‘opening’. She lists three days of note: April 1, All Fool’s Day; April 23, St George’s Day; April 24, St Mark’s Eve. I’m beginning the rough draft for this letter sitting in the old Memorial Hall where a few of us have just finished tidying up after last night’s entertainment. It’s raining outside but we are very comfortable here with our old-fashioned gas heaters keeping everyone warm. A peedie dram or two on such a dreary day and some lightsome discourse is just the thing to finish off this Easter break, I think. As you can imagine, apart from a few notes, I didn’t get very far with my draft. But we managed a strip the willow and a one-step before closing up the old hall. Now, a day or two later, I’m getting down to the business in hand. It’s a very fine morning with the skylarks singing and a blackbird is whistling not far away. It’s a dry day, with tumbling silvery-grey clouds that stretch from east to west and north to south, and the sides of the roads, here and there, are ablaze with daffodils. No sign of the sun so far, yet the day is particularly mild and the light south-westerly wind carries the sound of breaking seas from the windward side of the island. Anyway, to get back to our Easter event. Sidney Oglivie had written a little sketch, or a play, or was it a short concert? Or dare I say it was a pantomime? Everything has to be declared these days and described in minute detail. The time will no doubt come when everybody will have to fill in a risk assessment form before we will be allowed even to step outside our own door! Suffice it to say that Sid had created something that everybody enjoyed — particularly the young folk of whom there were 17 present. Eleven had actually come from the Orkney Mainland with friends and relatives for the occasion — if only they were all living here! Also coming from the Mainland was the Linklater band — Dave, on accordion, his mother, Elsie, on keyboard, and his father, Dave, on drums. Then there was Pat and Christine Allan. The North Ronaldsay Community Association had, after at least two previous attempts, managed to get Christine Allan (retired from Loganair 2006) and her husband Pat out to a function. The evening’s entertainment provided the opportunity for this Easter celebration and the opportunity to make a delayed presentation to Christine. the company of well over 70 before getting the evening’s performance under way. Sid had called his production Jock and the Beanstalk — or perhaps more appropriately — The Little Giant and the Birdie Folk. 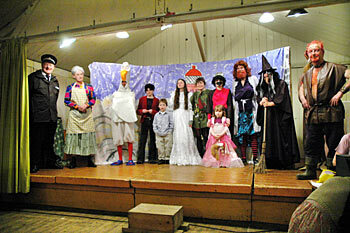 Here is a list of characters: Storyteller, Anne Oglivie; King Ravenus, Winnie Scott; Queen Robina, Bob Simpson; Birdie Princess, Lilly Gray; Jock, Alison Duncan; Jock’s Mum, Kevin Woodbridge; Cow, Ronan Gray; Hansel, Anna Scott; Gretal, Heather Woodbridge; Goose, Paul Brown; Giant, Sid Oglivie; Giant’s Mum, Norman Bayley; Constable, Ian Deyell; Inspector Collapso, Paul Brown; Witch, Carole Bayley. It was great to see a few of the younger generation taking part: Heather Woodbridge, Anna Scott, Ronan and Lilly Gray. Attending to the background music (The Hansel and Gretel Overture by Engelbert Humperdinck) was Edith Craigie. The exotic and often amusing costumes had been made by the cast as had the scenery. Three scene changes added to the drama: Outside Jock’s Cottage; Cloud Cuckoo Land with the Castle in the distance; and Inside the Giant’s castle. So began the evening’s entertainment. As you can imagine from the characters, all sorts of things happen: the giant that turned out to be a little giant, but who nevertheless liked to eat the Birdie Folk and bairns; the witch who paid for Jock’s cow with the magic beans; the goose that laid golden eggs; the King and Queen of the Birdie Folk; the Cloud Cuckoo Land Police Department; Jock, who sets out to vanquish the giant and who sings When you wish upon a Star and Somewhere over the Rainbow; the Giant’s song, a version of Count your Blessings; the giant’s defeat, capture and punishment. And thus we arrived at the happy ending with Anne Oglivie, the storyteller, summing up and giving a moral to the story: “And so the years passed and Jock and Gretal married and went to live on Cloud Nine. And though the little giant (sorry, big dwarf) sometimes missed his Sunday roasts, he realised he was much happier being friends with his neighbours. In fact he discovered one of the most important lessons in life. Every cloud has a silver lining, but you must look for it if you want to find it”. All the cast then sang Look for the Silver Lining. After resounding applause, everyone was asked again to show appreciation for such grand entertainment and for providing this opportunity for an Easter celebration. Next was a tribute and presentation to Christine Allan. In 1974 Christine had embarked on a career with Loganair that lasted 32 years. Loganair had, in 1967, reinstated Captain Fresson’s short pre-war inter-island North Isles air service. Those were the early days when Loganair was a large and very busy organisation. Flotta and the oil business were at their height, with Loganair often arranging transit for oil-rig crews flying by helicopter when required. Air charter work featured prominently, and not only was there the North Isles air service but Flotta — at that time a very busy oil-terminal — and Hoy also received a passenger service. North Ronaldsay was to receive extra passenger flights including a once weekly air-freight service of perishable goods. In those early days too, Loganair was in competition with British Airways, with Loganair staff arranging bookings etc, to Wick, Inverness, Glasgow and Edinburgh. There was also, of course, the efficient ambulance service to the islands that after many years of reliable work was recently, unjustifiably, terminated and replaced with a questionable alternative. Then there was the franchise period, with Loganair becoming independent again in 1997. Through all those years, Christine gathered much experience behind the desk becoming for some years senior customer services officer in charge of the office. More responsibility fell on her shoulders with the early death of Bob Tullock in 1998, when her years of experience proved invaluable. Christine’s consideration and help, especially in connection with North Ronaldsay, will always be remembered. As a token of the island’s appreciation and thanks, Helen Swanney, manager of Loganair’s service’s on the island, was invited, on behalf of the community association and the local community, to present Christine with a North Ronaldsay woollen rug and a piece of Ola Gorie jewellery. This she carried out most graciously. And to complete a very pleasant occasion, the youngest member of the community, Lilly Gray, presented Christine with a bouquet of flowers. Christine, much moved by the occasion, accepted the gifts and thanked the community for their generosity to Pat and herself over the years. She said how she missed dealing with us all on the island but had taken early retirement to be with her husband. She went on to thank everybody for the beautiful gifts given to her on this evening. After the chairs had been cleared away and the usual dusting of slipperine applied to the much-used old dance floor, a short dance began with the Linklater family taking the stage and providing the music. Later, Sinclair Scott, on the bagpipes, got folk swirling in a lively eightsome reel. And so the evening progressed until it was time for refreshments. Tea was served with a splendid assortment of sandwiches and homebakes. This welcome break gave the opportunity for the raffle to be drawn. Ian Deyell, in great form, worked his way through a very large assortment of prizes, the execution of which was almost all-together another sketch. The raffle brought in a very generous sum of over £150 that the community association and the cast of the production kindly gifted towards the Memorial Hall’s funds. A few more dances were managed before Auld Lang Syne brought the evening’s celebrations to a close. Well, I must also bring this Easter letter to a close. I thought it would be nice to remember the words of the song with its good advice that the cast had sung at the end of their performance: Look for the Silver Lining. When e’er a cloud appears in the blue. The above verse by Robert Burns is quoted among a number of poems suitable for the month of March, by Edith Holden (1871-1920), who kept a diary for the year 1906. I have mentioned her illustrated diary before. She, by the way, was drowned in the Thames at Kew, while gathering buds from a chestnut tree. As well as quoting some favourite poems and verses, and writing up her diary, Edith Holden gives an explanation as to the derivation of each month of the year. I suppose one could say that March came in like a lion so we might hope for a fair end to the month. Already there is a feeling of spring in the air, and the daffodils along the roads and in gardens are not far from brightening up the island with flashes of yellow. But for all that, March is a month to be wary of. The other day, I visited the gardens at Holland House. The snowdrops are past their best but they last a while under the shelter of the old trees, and the garden dykes, where they are scattered in great profusion. They are well worth a look when in full bloom. Anyway, on this visit, I was looking to see if the primroses were beginning to flower. Only one or two of the pale, lemon yellow-coloured flowers had opened — a bit early yet I thought. Another week or so and they will be decorating the brae in front of the big house in clusters. And the bluebells, of which there are hundreds, will follow a little later to please the eye. Where they are in greatest profusion, their delicate scent will pleasantly pervade the air. Winnie (the school cook) has just phoned to tell me that the eclipse of the moon is in full swing. It’s 11.20pm — just the time predicted. I left all and stepped out into a darkened night. Earlier, a virtually full moon lit up the island almost like the day. What an amazing sight — a pale, coppery, blood-red orb high in the southern sky. The night is chilly and I saw, guided by the constellation of the Plough to the North Star, that the wind is south-westerly. As it will, I believe, be another six years before the next full lunar eclipse I am away out for a road walk (not to Riff Geo this time) so that I can observe the changing scene. I first walked south, past the War Memorial, its granite cross silhouetted against the sky, and remembered the war dead. Then on to the Memorial Hall where perhaps the ghosts of past generations relive, for a time, great days and dance a jig or two. Great days too, of old, across the road on a Saturday night, at the one-time shop of Roadside (now a pub and restaurant). On such a night the shop would have been full of folk from about every “tunship” — of which there are six. And what about the talk? What talk indeed, what stories, fun and banter! Further I travelled, and from nowhere it seemed — for no visible clouds could I see — a fine rain merely dampened my face for a minute or two. Could it have been some ghostly lunar shower in keeping with the strangeness of the night? Next, I passed Holland’s gardens where stark, leafless branches of the many trees creaked in the wind. And where the dominating shape of Holland House and the adjacent steading buildings, silent in the night, stood out black, and somewhat menacing against a starry sky. With my back to the moon and the wind, I walked home. Once, when looking round from time to time, I saw a pale, misty-looking cloud, like a fine gossamer veil, briefly pass the face of the moon (now beginning to regain her brilliance) and for a moment a little halo of rainbow colours could be seen. Well, I’m returning to my Holland gardens visit. So fine was the day, with summer looking clouds passing overhead and a tingling northerly wind, that I had a good excuse to dilly-dally for a time. So I sat myself down in the shelter of the building on a very old, cast iron seat. Across its frame were bolted slats of an enduring hard wood — probably oak. The seat dates back to far off days when the then Laird was in full residence, and when, in the summer and later, the house would have been a hive of activity, with family and friends on holiday; croquet on the well-kept lawn; golf at the north links and the shooting of game later in the season. All of this with whatever island administrative business that might have been on hand. As I sat in the surprising warmth of the afternoon sun, I thought of such things and of how the island would have been 100 years ago. How today, I wondered, would the then population of well over 400 (436 in 1911) manage to survive? Such an existence would well nigh be impossible given the vast changes in agricultural methods and circumstances, and with present-day economics, attitudes and expectations. My view south more or less encompassed the North Ronaldsay Firth with the islands of Sanday, Eday and Rousay in the distance. One begins with the Start Lighthouse in the north of Sanday but it’s actually furthest east from my position. In the west, Westray lay stretched across the western approaches. Part of the firth was a sheet of blinding silver caused by the sun’s reflection. It fairly dazzled the eye but where a large bank of cloud stopped the sunlight, the sea, near the Sanday land, was dark and almost black by contrast. In the background I heard a skylark sing and a little wren whistled nearby. The smart black-headed gull is back and the lapwing, oyster catcher and curlew are to be heard almost every passing day. For a time I idly reminisced. How many times had I crossed that stretch of water by post-boat to Sanday I wondered? Twenty-five to thirty times maybe, when we came and went from Kirkwall and further afield. If it was not by post-boat, then it was on the old coal-burning steam ship, the Earl Sigurd, and almost as many times but by direct passage. Then, going back to the last years of the war — since, in 1945, I would only have been five years old — I can remember the four tall pylons on the north end of Sanday that formed part of Britain’s early warning radar system. I read recently that two were steel pylons (350ft high) and two were of wood (240ft high). They were removed some years later. It is a little surprising to think that the steel towers would have been just higher than double the height of our New Lighthouse (139ft) with the Old Beacon (70ft) placed on top. The pylons formed part of a chain of such stations that stretched from Land’s End to John o’ Groats and to Orkney and Shetland. The northerly stations gave warning of German bombers, flying from Norway (captured in 1940) on their way to attack targets such as the naval base at Scapa Flow. Another memory is of the smoke of burning fires of rough grass or bent that, in the spring, we could see in Sanday and on the higher hills of other islands. When the wind blew from the south, the smell of the fires carried all the way across the firth. I fancy I can still remember the almost pungent smell of the burning grass. From where I sat, looking across the south-west of the island, I could see the old ‘Stan Stane,’ that monolith of a bygone age. Then, not far from Gretchen loch, is the Laird’s pillar. It is a conical-shaped, 14ft high, stone-built construction. There, in 1924, while stepping over a dyke, the Laird at that time, W. H. Traill, lost his life as a result of a shotgun accident. Next in line one sees the site of South Cott, where once folk lived and worked. Part of the remains of the house was built into a square with a pyramid-shaped top. As I looked further north-west I could just see the one churchyard (there are two) which partly surrounds the Old Church, built in 1812. Within its walls lie the remains of probably all of the 400 or so folk I mentioned who lived 100 years ago. There, at that final resting-place, my line of vision ends with the house in front of which I was sitting. Well, that was my view from Holland House and those are one or two memories and observations. Over the time of my visit the bank of cloud referred to earlier seemed to creep up on the wind, which came from the north, until eventually it hid the sun from view. Suddenly it became decidedly chilly, and little wafts of cold air came furtively round the corner of the big house near to where I had enjoyed this pleasant break. I thought — enough of this; I’ll come back another day when the sun is shining, and the primroses and bluebells are in full bloom, and when the North Ronaldsay Firth dances in the sun. What would Burns have made of modern life? I began my last letter by remarking on how fast the Yule time comes and goes. Now Burns’ Day has been and gone, and before we know where we are the first two months of winter — December and January — are behind us. But in these days of global warming, anything can happen, with the old sayings seemingly having less and less significance. George Mackay Brown, when he was writing those marvellous short essays for The Orcadian (Under Brinkie’s Brae), often paid a tribute to Robbie Burns. Then again in another letter: “So, when the Kilmarnock Edition (of poems) was published, Scotland had suddenly a new hero, who reminded the Scots of their past glories, and put strength and joy back into their threatened language, and at the same time appealed to new stirrings in the human heart: the notion of the dignity of all men and women, even the poorest and the humblest. On Saturday, January 27, we celebrated Burns. Evelyn Gray, president of the North Ronaldsay Community Association, welcomed a company of upwards of 50 folk, islanders and friends from the Mainland, and the association’s seven invited guests, all of whom contributed to the Burns programme, and to the dance that followed. Vivia Leslie was our main speaker. Her husband, Allan, gave the Address to the Haggis. Lesley McLeod played fiddle selections, and her husband, Alastair, proposed the Toast to the Lasses. Mark Wemyss was the piper. Dave Linklater (accordion) and his mother, Elsie, (piano) played for the dance, as, of course, did Lesley and Mark. Of no less importance was John Cutt, Gerbo, with Jenny Mainland and Ella Henderson, who are former islanders, coming from the Mainland, where they now live, and being asked to contribute to the programme at the 11th hour. But more of their participation in a minute. To the skirl of the pipes, in marched Mark Wemyss in his Stromness Pipe Band uniform, playing A Man’s A Man for A’ That followed by the chief cook, Winnie Scott carrying the haggis. Both received a civil dram. Allan Leslie gave a spirited and very competent Address to the Haggis and John Cutt recited the Selkirk Grace, before the traditional Burns supper. Then, after the meal, in candle and oil lamp illumination, Vivia Leslie, rose to propose the Immortal Memory. She took as her theme the love songs of Burns, tracing the life of the poet. She touched upon many aspects of his life: his humanity, how he brought Scotland’s history back to life, the collection of some 370 airs and tunes, his great ability to combine tunes and words. Interspersed between those, and many other tributes, Vivia sang with much expression three of his songs: Whistle and I’ll come to you my Lad, The Braw Wooer, and, as she said, one of Burns’ greatest and most moving songs, John Anderson my Jo. Also, through the eulogy, she led the communal singing, with accompaniment from Lesley and Dave, of four other favourites: Ca’ the Yowes to the Knowes, The Banks o’ Doon, Ae Fond Kiss, and My Love is like a Red, Red Rose. In Burns’ songs, Vivia believes, one can see and understand the man, and his songs are songs for the people, indeed, for all mankind. With glasses raised the toast to Robbie Burns was proposed. Alastair McLeod followed with a thoughtful Toast to the Lasses, noting that Burns’ main and abiding interest was his love of women and poetry. How would he relate to today’s women with their quite different lifestyles; their ability to be multi-functional and so on? What, for instance, would Burns have made of all this and the new forms of communication — the world of the computer and the internet? After much speculation, using verse which he had composed in the style of Burns and other references, Alastair concluded, that, since Burns was one of the world’s great communicators, he would probably have made use of the latest technology. Alastair finished with the toast to the lasses. Jenny Mainland, in reply, thanked Alastair for his remarks. She went on to reminisce about her young days in the 1940s and early 50s in North Ronaldsay when she, and many others of her age, used to go visiting together at Yule (the population then would have been around the 200 mark, rather than ‘well over 160’ as stated in my last letter). The brewing of ale was a great time and an important time in the island; very special days to be remembered. Jenny then turned her attention to another toast, which Howie Firth was to have given. Still on the theme of celebration and of looking back, she explained how her generation had been brought up to appreciate Burns and went on to recite John Barleycorn. Jenny then proposed the toast to North Ronaldsay. John Cutt followed with a humorous poem, written in fairly broad Scots dialect, called The Broken Bowl (composed by Jessie Morton, born in Edinburgh around 1824). Fifty years ago John had recited the poem at one of the many grand island concerts held in those days. John’s recitation, carried out in his inimitable style, was much enjoyed. Next on our programme was Lesley McLeod playing a selection of fiddle music with which Burns would have been familiar. She chose compositions by Neil Gow (1727-1807) and William Marshall (1748-1833). As always, Lesley’s fiddle-playing was a pleasure to listen to. Especially beautiful was her interpretation of Neil Gow’s Lament for his second wife. This music, played in candle and lamp-light, always takes us pleasantly away back in time and memory. To conclude the programme, it was time for Burns’ favourite poem, Tam o’ Shanter. Ella Henderson, standing in for Howie Firth, who was unable to come, came forward to recite the famous poem. Ella also, like Jenny, remembered her school days in the 40s, and how, when she and her brother and sister had the German and the ordinary measles she had been given the task, by her father, to learn Tam o’ Shanter and entertain her two ill siblings. After all those years Ella was still able to recite much of the poem with expression and style. Dancing soon got under way with Lesley McLeod, Dave Linklater and Elsie Linklater providing the toe-tapping music. As the evening progressed Mark Wemyss played a scintillating series of tunes on his pipes that almost had folk up dancing. Many dances were managed, with our own Heather Woodbridge (KGS pupil) playing along with Lesley for a spell, before tea was served with Westray shortbread and Christmas currant bun. 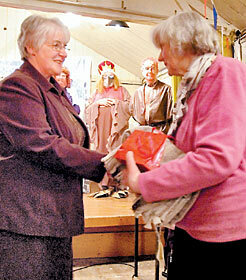 A raffle in aid of the community association’s fund was drawn bringing in over £130. On went the dance until the second last dance when, playing the pipes once more, Mark put the two sets up for the eightsome reel through their paces. After the last dance and the singing of Auld Lang Syne, Evelyn Gray was carried shoulder high round the hall, thus bringing a most enjoyable evening to a close. This is Candlemas Day, February 2, and as it happens the night of a full moon. It has been a day of sunshine and showers so whether “half the winter is to come or mair” or whether half “is by in Yule” is anybody’s guess. All the months of the year. Thou shalt see a summer wonder. As Alastair speculated about Burns’ reaction to today’s communication systems and how he would relate to modern-day women. What, I wondered, would he think of some of the news headlines of today? Thousands die in Africa and elsewhere from AIDS, starvation and war; Dire warning by scientists: Catastrophic climate changes; UK like Nazi Germany: Moslem leader; PM defiant over police honour probe; Curse of oil sees corruption in Nigeria; Chinese tortured Tibetan refugees; Palestinian truce but killing goes on; Iraq: a political catastrophe. After over 200 years of progress, invention and thinking, since Burns’ death in 1796, it seems we are as far away as ever from the ideals and hopes of Robbie Burns. Do you think that the world will ever achieve the ideals expressed in A Man’s A Man for A’ That, the last verse of which I shall quote to finish this letter? Shall brithers be for a’ that! How fast does the Yule time come and go. Today, as I begin to write, on January 6, 2007, the main Yule events are past though I still have to sally forth on my New Year visits. Antabreck’s Christmas decorations are still up but before the day ends, down they will have to come. So, for a moment, under the sparkle of tinsel, Christmas cards and the last burning of my festive candles, I’m thinking back over the holiday period in order to record the Yule activities. After a fundraising whist drive for the Christmas Eve party, there was the island Christmas dinner provided by School Meals. The meal was followed by the little sketch. Goldilocks and The Three Bears, performed by the school pupils, Duncan, Cameron, and Ronan Gray and Gavin Woodbridge. Four carols were also sung. Supervising the proceedings was the head teacher, Sue Gilbert, and the itinerant music teacher, Elaine Geddes. Marion Muir and Edith Craigie assisted with costume changes etc. On Christmas Eve, the bairns’ party took place with Santa and his helper, Winnie Scott, adding to the fun this year by presenting a little gift to the adults as well as to the few young folk present – two had left earlier for a visit south. A carol service in the new centre was conducted by the Rev John McNab with keyboard accompaniment for the singing by Ann Tulloch. Then, on December 30, by which time extra holiday-makers had arrived, an end-of-the-year get-together was arranged with much talk, good food and a little dancing from time to time. 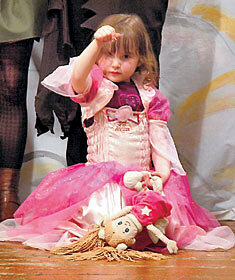 Two young families, including five very active bairns who kept folk on their toes, were among the visitors. All those events were greatly enjoyed. Hogmanay and the New Year were celebrated in style. Also managed was a bracing visit to the “Stan Stane” by a few stalwarts and some keen, new participants. Afterwards, as the moon began to lighten the first night sky of 2007, the monument visitors gathered together for a house visit, making a lightsome company for a time. As New Year’s night spent, some early first-footers came and went. Later, I stepped into a moonlit night well after the midnight hour had passed – or to use that favourite word of mine – after the “heuld” had passed. By then the weather had greatly improved and so magnificent was the scene and so bright was the moon – an almost full moon – that I set off along our north road for a walk. My fancy took me here and there, and, as I walked, many were the thoughts that came to mind. I carried a writing board and a pen with me, thinking I might record this and that as I made my way along the road. Looking over my notes I see that it was 2.25 when I began a venture which might well have been my last. But more of this later. My first thoughts, as always on Hogmanay and New Year, were in the difference of the island’s festivities at this time of year compared with the days of my youth. I have often written about those days of yore. Suffice it to say that on this occasion, at 2.25 in the morning, 50 years ago, I would most likely have been in company with somewhere around 20 fellow islanders. Their ages would have ranged from the teens to the early 30s, and we would have been visiting maybe four houses on “sooth yard” – the south end of the island. Then the next night would have been the turn of Linklet-tun and Aby-tun where another five or six houses would have been on our list. I have tried to work out the island population at that time. It would have certainly been more than 160. Anyway, as I walked along, I was thinking that that merry company of young folk amounted to well over a third of the present island population (60) – for even extra to that number would have been many too young to participate, plus some who didn’t gallivant. Those, of course, were the days of the home-brewed ale, when Yule was prepared for, and looked forward to with great anticipation, for weeks before. And, apart from the activities of the younger generation, the more senior men would have been enjoying their “tunship” visits with equal enthusiasm. Today, I hardly think that the island will ever reach that proportion of young folk again, and crofting will never be the main-stay of island life, even if half of that 1950s number of around 160 were here. Half that number would be a help though. Five young families with children would raise our dwindling population to about 80 and increase the school numbers. But, where are the houses? They would need to be built tomorrow – yes tomorrow – not over the next few years. But what work would sustain new islanders? Those are questions that have been asked for a long time without, so far, any real action or answers. It would not, I think, be much good if such folk were unemployed. No use if they could not adjust to island life or if they ignored custom and tradition; no use if they were unable to accept the comparative isolation of island life and were forever thinking that the grass is greener on the other side; or wanting to recreate their past lifestyle – always restless and determined to have a bit of both worlds. No help either if they were old fogeys like myself. Mind you, having been born on North Ronaldsay and having lived here for most of my life, I might be able to give some advice about various aspects of island life. Well, even if I didn’t, there is an old saying often quoted: “When in Rome do as the Romans do,” But remember too that Rome was not exactly all it was cracked up to be – now there’s a dilemma! In any case, I was thinking about other islands with similar problems and how they manage. One comes to mind – the Fair Isle, which lies some 25 miles to the east of our Dennis Head Beacon. The present population is 73, with eight pupils at the school, three nursery, and seven attending the main secondary school in Shetland. Some say that as the National Trust for Scotland owns the island (since 1954) comparison with North Ronaldsay would be somewhat unbalanced. Still, the above statistics sound good and it’s worth taking a closer look to the Fair Isle. Recently, the National Trust, which also owns the houses, advertised for two new families to replace two who had left, mainly I think because their children had reached secondary school age. Hundreds applied. Eventually, two families were chosen by a panel of Trust members and another person who represents the Fair Isle. Both families already had some work of their own – almost a necessity nowadays for new islanders – and were thought to be suitable candidates for the challenge of living on a relatively remote island and of contributing positively to the life of the community. It would seem, therefore, that if North Ronaldsay only had the houses, there would be no shortage of applicants. In the Fair Isle there are various committees/sub-committees that deal with such things as the museum, power supply (two 35kw diesel generators and two windmills – one 100kw and one 60kw), common grazings, com munity hall, housing and so on. But here, I believe, after talking with one or two residents, is probably the main reason for the island pulling together – which they do. All those committees report back to a general island committee once every three months. A chairperson is elected for a three-year period and then someone else takes a turn. Everybody can attend and is encouraged to do so. Any problems, controversial issues, disputes or whatever are discussed, debated and resolved – not left to simmer on, causing suspicion, ill-feeling and damaging divisions. And what about their infrastructure? The island has its own boat, the Good Shepherd, crewed locally, sailing three times a week in the summer and once in the winter – weather permitting. If cargo is too heavy or too much for the Good Shepherd then, with discussion and advance planning, a larger boat comes from Lerwick in fine weather with the necessary goods. TheGood Shepherd is limited in carrying and lifting capacity and can accommodate only 12 passengers. An Islander aeroplane, operated by DirectFlight, flies in and out twice a day on Monday, Wednesday, Friday, and on Saturday in the summer, and on Monday, Wednesday, and Friday in the winter. Each year, teams of ten or so volunteers at a time travel to the island. They assist with all kinds of island work. Their accommodation and food is generally supplied by the two organisations that operate three or so camps in the summertime. They are the National Trust and International Voluntary Service. But the Fair Isle residents, who benefit greatly from such assistance, help out with food and other necessities, including entertainment. Medical requirements are attended to by a resident nurse and a monthly visit from their area doctor based in Shetland. So there’s a perspective of another island, arguably more isolated than North Ronaldsay and with fewer communications – yet they seem to be a very contented community, all working together. There is, by the way, a fine book called Fair Isle: An Island Saga written by Valerie M. Thom. Although published in 1989, it gives a good account of the island’s history and way of life. Now I’m back looking at my notes. As I walked further northwards, I was surprised at the brilliance of the moonlight. Great white clouds billowed up in the east against an expanse of sky in which stars shone, but not with the sharpness of darker nights. To the west, where my footsteps finally took me, a restless sea, angry at the never-ending Atlantic depressions, rolled landwards. Since the moon was in the west, the sea below was a sheet of silver and those waves came marching in one by one, black against shining sea, before exploding on jagged rocks. And further out, where clouds sometimes blanked out the moonlight, long strips of darkness would break up the bright silver of the sea. Winter pools of water here and there, rippling in the fresh westerly wind, turned into sheets of silver when the moonbeams were at the right angle. Soon, I arrived at Riff-Geo – a steep, sea inlet flanked on either side by high rocks and joined by a bridge of rock, thereby giving the name. Many years ago the top part of the joining rock was blasted away so as to prevent the native sheep crossing over and creating one of the two barriers which prevent the animals free access round the island. Geos are always interesting places to venture into as they often act as catchment places for drift. I suppose I was remembering old times, and, without thinking, down into the depth of the geo I ventured, stepping carefully on jumbled stones, both large and small, white and dry in the moonlight. Ah, but in one area the receding tide had left stones covered with the grey, frothy residue of heavy seas that looked as white as the higher, dry boulders upon which I had been stepping with fair confidence. Crash! One moment I was vertical and the next horizontal. My writing pad flew in one direction and my pen in the other. Fortunately, I suffered no real damage, apart from a bruised elbow. When I was relating this foolish escapade to my neighbour next door, from whom I receive frequent timely lectures, he said that had I suffered serious injury and lain in the tidal geo I would have eventually been found like a “puir aald droonded sheep.” The moral of the story is, don’t go down alone into sea geos or below the high-tide-mark on the “heuld” of the night. Recovering from this shock to the system, I moved north along the high banks watching the breaking waves and seeing familiar places: Antabreck Geo, Verracott Geo, South Himera Geo, and finally, Himera Geo (the cave geo). Nearby, just below the rocky face of the banks, there is a natural freshwater spring. There, as once long ago, on a similar moonlit night early on a New Year’s morning it was – I lay down to take a drink of the running water. At the time of that earlier visit, we were coming to about the end of those great days when home-brewed ale was still around, and when Hogmanay and the New Year were a time of old fashioned magic. I remember afterwards visiting a house not far away to wish them a Happy New Year. So now, as I finish this letter, on Aald New Year’s day (January 13), I take this opportunity to extend the same wish to all my readers. Do we really need to restore Old Beacon, or is conservation the best way to proceed? When I was writing one of my letters to The Orcadian in September, I referred to the BBC Restoration Village competition and of how, at that time, the Dennis Head Beacon had won the Scottish entry. As everybody now knows the island went on to take third place overall – a noteworthy achievement indeed. The BBC Restoration programme obviously captured the imagination of many people. There is, without doubt, an undeniable romance and mystique connected with lighthouses: the history of their construction; their eye-catching, elegant design; their presence round the coastline of Scotland, England, Wales and Ireland, and, of course, their guidance to shipping with the familiar motto ‘For the Safety of All’. People voted for the Beacon up and down the land, and as a result great publicity was achieved for the island with whatever benefits it might bring. * The outside and inside of the tower to be picked and pointed with doors and windows replaced. * A “green road”(?) to be constructed between the public road and the Old Beacon. * The restoration of the ruined cottages with finished interiors which will include box-beds etc — forming what is described as a living museum. * Water, electricity, public toilet facilities and lighting systems will be installed. * A replica lantern will be constructed at ground level. Another part of this restoration package is the repair of the New Lighthouse pier (still in use locally for fishing activities) some distance away – a necessary, and easily achievable piece of work. Of course, those structures are listed with an A listing for the Beacon. In my letter I merely touched on another word used by those who have responsibility for ancient monuments in England and Scotland. That was the word conservation – quite a different word from restoration. I had hoped there could have been a debate within the island as to which of those two might have been chosen or preferred by islanders. Hopefully, this debate will be undertaken by Historic Scotland. I also, in the letter, mentioned the name of William Morris, who was responsible for establishing the Society for the Protection of Ancient Monuments in England in 1877. He argued very strongly for conservation rather than restoration. 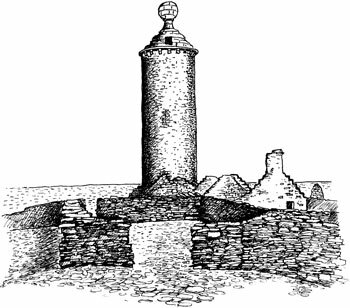 The original plans for the tower and the lightkeeper’s accommodation show the tower to be only 26 feet in height, though in the ‘agreement’ with the two masons, John White and James Sinclair, Kirkwall, it says the tower shall be 60ft high. The thickness of the tower wall (in the plan) is 3ft 9in at the base narrowing to 3ft at 26ft. A measurement taken at the actual base appears to be some inches over 4ft – ensuring more strength. The plan details a solid stone stairway. The steps (sandstone) were broken down at a later date in order to prevent access and little now remains. The plan for the lightkeeper’s cottage shows only one house. In fact there are two, with the west-most facing house having been added, possibly at a later stage – the division between the two is clear and there is no connecting doorway. From close observation the remains of Welsh slate can be seen at the point of abutment with the tower, which would indicate that roofing was of Welsh slate. Measurements of the remains of the two joined houses indicates that what was built (excluding the second building) does not match the plan. However, those inconsistencies and lack of every detail, may not have been unusual in the early days when the first four experimental lighthouses were built. There is no indication of the interior finish – box beds etc – though we know that a box bed was acquired by a farm on the island after the vacation of the building. The restoration of the joined buildings, and the interior, will therefore be restored, it seems to me, based on conjecture rather on proof. The keeper’s house was still intact in 1871 when a local family connected with lighthouse work – the New Lighthouse (lit 1854) – was recorded in the census as living there. Shortly after this the building was vacated and, presumably, the roof removed at the same time. So far, seriously missing from the Beacon’s history, as presented to the public, is the very obvious fact that the structure is extremely vulnerable to heavy sea. Certainly, it has often been said that during the inhabited lifetime of the living quarters, the sea entered the buildings on more than one occasion causing the inhabitants to leave. Today, it is very evident that sea-thrown stone has piled up on the seaward side of the buildings so that the floor of the dwelling houses varies from being 1ft 8in, to over 4ft below the outside surface. One can see, for example, how unusually low the seaward-facing window in the first cottage is in relation to the outside ground level. As recently as 1993 (when considerable damage was done to the A-listed sheep dyke) the wall of the sheep pund (trap) which borders the cottage buildings was partly demolished. The dyke is really no distance from the building and without doubt, with the right combination of sea, wind and the height of a stream tide, water would have been sweeping through the area. With the predictions of global warming and subsequent rising of sea levels this problem will probably become much worse as the years pass. The Old Beacon tower is quite sound and stands as straight as the day it was built (John Sinclair, former OIC building inspector, now deceased, stated in a report written in 1995: “As it stands at present, it would be reasonable to assume that further deterioration of the structure would be minimal and I would fully expect the Beacon to be structurally sound in another hundred years”). The masonry ball which so elegantly crowns the tower also appears to be sound. The masons who placed the ball on the top of the tower certainly knew, one would think, what they were about. To have remained in place for 200 years – come 2010 – is surely proof that it is on the rather unique design of the stone base upon which the cone and ball stand that everything depends, not on the visible, seemingly fragile, few wood timbers. However, a proper survey by an architect or civil engineer should confirm the durability and construction methods employed to build the supporting structure and whether, in fact, there is a problem. Health and safety requirements to allow tourists up on the top would certainly seriously alter the elegant lines of the top structure and the architectural balance of the tower. In fact, I should think that the top stone work would have to be changed (almost re-built in fact) to allow sufficient width for a safe walking passage-way and to provide some form of secure base into which suitable railing could be securely fixed – both to prevent falling from the top and prevent access up to the masonry ball. In any event, what is the point of climbing another tower when the New Lighthouse commands a spectacular view at almost twice the height (139 ft) and boasts the highest land-based lighthouse in the British Isles? After all, we are talking about an unlit beacon which was not designed for sight-seeing from the top. Why sacrifice the aesthetic appeal of the tower for an unnecessary balcony? Two eminent Scots have both publicly stated that the top of the Dennis Head Beacon should not be compromised: Professor Roland Paxton MBE FRSE (The Scotsman, July 27, and Margaret D. Street MBE FSA (Scot.) The Orcadian, August 31). Roland Paxton, teacher, researcher, writer and honorary professor at Heriot Watt University, along with Jean Leslie wrote the book Bright Lights – The Stevenson Engineers 1752 – 1971. He is a Fellow of the Institution of Civil Engineers, a former chairman of its panel for Historical Engineering works and commissioner on the Royal Commission on the Ancient Historical Monuments for Scotland. Margaret Street is a former chairman of the Saltire Society, and a life member of the Orkney Heritage Society, having been involved in raising money for St Magnus, the conservation of Papdale House and the Strynd. She has also been involved, and still is, in the commemorations of Samuel Laing and John Rae. In addition, the preservation of the North Carr Lightship, Wallace statue and many other commemorative project achievements, can be listed in a lifetime of dedicated work for Scotland’s heritage. What many of us on the island and elsewhere would like is a professional inspection of the tower, with scaffolding erected outside and inside, with the purpose of checking on the top structure and making sure that the crowning masonry ball remains safely in place for the foreseeable future. In addition, we would want what remains of the dwelling houses to be preserved in their present state. Weather-resistant outside display boards, now commonly in use at historic sites, could be installed with a general tidy-up of the area. The buildings could be cleared from fallen stone, and beach stone thrown in, from time to time, by over 200 years sea invasion. An easy, safe access to the buildings; a ‘cleaned out’ tower, made secure against further bird invasion would be necessary. There is also, of course, the immediate repair of the Lighthouse pier – a real south-easter would certainly inflict more damage. The argument put forward that the Old Beacon project would secure a glowing future for North Ronaldsay needs to be debated. It would, no doubt, increase tourism but it does not solve the one pressing, serious problem that the trust, along with the community council, should be addressing even more vigorously – lack of housing, jobs, and young families. With about 34 of the present population of 60 inhabitants over 60; five in the 50 – 58 category and around nine aged 30-50, it’s time to concentrate on the three essential requirements mentioned above. An ambitious programme of change and development is slowly going on at the New Lighthouse, costing many thousands of pounds. In explanatory trust literature and the BBC Restoration programme, the Old Beacon is mentioned, along with the development of the New Lighthouse. I was thinking, therefore, that, perhaps, instead of attempting to restore those vulnerable cottages, Morris’s idea mentioned above could be considered. This could be a carefully-designed interpretation centre constructed entirely separate from the Old Beacon. Additional exhibition space would be gained and such a building, with modern amenities, would be safe from sea invasion. The Old Beacon is spectacular – provided the masonry ball remains in place. It always has been so and will always attract visitors, as presently does the New Lighthouse. Once the National Trust for Scotland promotes the two high-quality, self-catering houses planned for the New Lighthouse many more people will be tempted to visit the island. The full restoration programme will, to my mind, most certainly change the appearance of this familiar and enduring monument and the unique atmosphere of the Dennis Head area created by the passage of time. There is a continuity there of landscape, ancient stonework backed by the sea and sky in every colour and mood. I was there recently making some studies of the beacon. Before I left, the moon was rising behind the dark tower and ruined buildings. The scene was truly magnificent. As an artist working in North Ronaldsay, these past 44 years, I would be very disappointed if any of those irreplaceable icons were to be unnecessarily lost without a full and open debate with the people of the island. I hope that Historic Scotland will look very carefully at any changes proposed to the Old Beacon. It is a monument of national importance, familiar to generations of islanders and passing mariners. There it stands on the Dennis Head peninsula, an imposing landmark and, I hope, a lasting memorial to Thomas Smith, the engineer, and those masons and builders who built it there over 200 years ago. Let me now, if I may, comment on another island issue that has featured prominently, recently in The Orcadian. Since it has generated much discussion on and off the island, perhaps it should be mentioned. Certainly, it merits further open debate. Once, North Ronaldsay was almost self-sufficient. It was an adventure to get to the island and, once here, there was a real sense of island life and this is something we need to preserve. Its population in the 1930s was around 283 and by the 1960s still over 130. The island was served for a time by a steam ship sailing once every two weeks in the winter, once a week in the summer and run by a company that had to balance its books at the end of the year. Nowadays, we hear, it costs millions to subsidise the running expenses of the ro-ro system. Will this support continue I wonder? On steamer days, in the summer time, the pier was covered with tons of unloaded cargo with many islanders’ goods waiting to be shipped. Today, as a result of a seriously depleted population, the turn-about time of our weekly ferry can be as short as 35-45 minutes. Indeed, one might ask whether the weekly, wintertime, freight trip is justifiable in terms of time and oil spent. Are all those many scheduled trips to the other islands that we read about really sustainable? Is this the only way for the islands to survive? What, for example, is the breakdown on cargo shipped here and there and what is the revenue generated? And the problem, if it is indeed one, of getting certain types of material out to the island in a timely fashion could perhaps be resolved with better planning and negotiation. During the summer months, we have three planes per day for seven days, with a freight plane carrying perishables once a week. More planes are being asked for, plus extra freight flights – even night-time flights are being considered. A second ferry in the week (summer time) has been requested. It’s argued that this is essential. But, once implemented, will this then lead to more planes, more boats, more cars, more tourists? Is that what the island really wants? Let us be careful that we don’t kill the goose that lays the golden eggs and destroy the real values of island life. I reiterate the three essentials which most islanders agree are vital if this island is to survive – houses, jobs and young families. I have just returned from posting some letters at our local post office While I was waiting for attention, I was thinking of the scene that would have been before me had I been able to travel back in time. I’m thinking of, I suppose, some 50 years or more ago when the population would have been around 140. In those days it was fairly common for islanders to send Christmas presents of domestic fowls to their relatives. Such a gift in those days was greatly appreciated. The post office would have been very busy around this time of year. In would come first one customer and then another. The legs of the hen, duck, or whatever would be tied and labelled, and round the head would be securely wrapped some brown paper. Those Christmas gifts would go to the Orkney Mainland and even much further afield. In the wintertime the island’s post boat would still be making the passage to Sanday, though weather conditions at that time of year caused frequent delays. Otherwise, the SS Earl Sigurd might carry the Royal Mail. For a while that service only occurred once a fortnight. Sometimes neither post boat or ship would be able to make the trip, which often then meant that the perishable gifts certainly did get the ‘hanging time’ recommended for game. Such carryings-on would not be tolerated today. As I write I can hear the early morning Loganair plane taking off on its return journey to Kirkwall. Yes, we are living in changed days. And still on interesting reminiscences from the past, this time I was managing a little shopping at the local shop, Trebb. There I was, telling of a recent unfortunate episode when I had burned my foot with a hot water bottle. Just imagine such a thing to happen. Anyway, the conversation then centred round the old-fashioned way of making one’s bed warm at this time of year – before the days of rubber, hot water bottles or electric blankets. When I was staying in the early 1940s at the house in which I was born, there would have been at least eight individuals living ‘under the same roof’ as they say. How did we manage to heat up cold beds one might ask? In those days there were at least two makes of stoves. The Enchantress was one and the Victoress, or was it Victress, was another. Those cast iron stoves, of size 6, 7, and 8, stood well out in the kitchen or living room on four ornate-looking legs. They had, I remember, two little iron doors that could close up the front which had narrow bars, or ribs, as we used to say, to hold in the burning coal. And just above that was a narrow, oblong, plate which could be opened for shovelling in coal or sometimes dried cow-pats. When the fire was open, its redness and heat was very lightsome on a cold winter’s night. A little platform extended in the front with a small recess to hold the ash. On either side were two oven doors, and on at least one of those stoves two smaller doors situated near the burning space of the fire could be utilised, I believe, to shove in a long wood log which seemingly burned satisfactorily. Those fires – were they, or, at least one of them American – were polished with a black polish called, I think, Zebra and on the lid of the box was, in fact, the striped (yellow – why yellow? – and black) body pattern of this animal. Also, I remember, on the doors – oven doors, front and side doors – was an attractive design in relief. But I have digressed mightily. I was going to tell you that the method that I remember best for heating the beds was a carefully chosen, round, not too thick, beach stone. Those stones, some nine or ten inches in diameter, were put into the fairly ‘roomy’ ovens through the day and so by evening they were very hot. As bed-time drew nigh, old stockings or whatever were used to cover the stone bed warmers. I recall especially the lengthy ritual associated with the covering and dispersal of the bed warmers. Believe it or not this method of warming one’s bed was very effective and, through time, the stones became quite smooth and shiny and a dark brown colour. Also, I may say, folk had lame or ceramic bottles, called ‘pigs’, which were filled with hot water. They were a round shape, maybe ten or more inches long and some six or so inches high and are still available. Well, we will not be allowed to send Christmas presents such as those I’ve described, but there is nothing to stop one making use of the old stone bed-warmers – I’m certainly tempted to try one just for old times sake. This brings me to the main reason for writing this letter. On Saturday, November 18, the North Ronaldsay Lifeboat Guild held its annual fundraising event. President, Isobel Muir, opened the proceedings with Evelyn Gray, treasurer, and Sheila Deyell, secretary, on duty at the various stands. On sale were the usual Lifeboat Institution’s Christmas cards and a variety of other sale-catalogue goods. There were many other donated items: vegetables, books, baking, jars of home-made jam, ornaments and other attractive things were nicely laid out on tables. In addition a goodly collection of raffle prizes tempted folk to buy tickets and that alone brought in over £100. Total monies spent amounted to almost £700, a magnificent sum indeed. Those present enjoyed refreshments at set tables after the event. How very fine it is to have such a get-together in order to support that great organisation, the Royal National Lifeboat Institution. Time to finish I think. I’m about to make my tea. For a change I shall set about cooking a bit of codling. Codling, I may say, fished from around the ‘Riff Dyke’. Yes, on two fishing trips, our (my partner and myself) 26-year-old boat, the Mary Jane, – still in very good shape – cut her way through blue seas and three of us successfully tried our luck at the fishing. Ivan Hourston, the Shapinsay boatbuilder (now retired) certainly made a fine job of the Mary Jane. The boat, scaled up to 20 feet LOA from detailed measurements, was based on that most famous of our island’s boats, the North Ronaldsay Praam. The one time Coxswain of the Aberdeen lifeboat, and lecturer in sculpture at Gray’s School of Art, the late Leo A. Clegg, DSC drew up the plan. The name of the most successful of these praams, and the one used as the model, was the Ruth (15ft 9in LOA) built in the early 1920s by the island boat-builder, Hughie Muir, Shaltisquoy. William Alister Muir, Waterhouse, his grand-nephew, who died recently, continued to make use of this boat until he hung up his sea-boots in 1982. How very enjoyable it was to venture forth over familiar waters once more and to see, as the afternoon spent, the low shoreline with the little houses beginning to darken against the evening sky. And how very grand it was to see the diving gannets in the distance and to watch that most graceful of flying birds, the fulmar. They would glide and bank, away up into the sky and back round the boat skimming the water one minute and then, with almost unmoving wings, climb once more into the pale blue of a faraway sky. When last I wrote, it was the time of the Harvest Moon. More than two months have passed since then and when I stood outside after the ‘heuld’ to think of some way of ending my ‘hairst’ letter. Tonight, I begin with the same process — outside as the midnight hour slips away. Again, I heard that same familiar bird, the lapwing or tee-wup, cry. And may I call her the Harvest Home moon? For we have just ‘goodly’ had our harvest celebration — well, she is to be seen just as in my last letter. In the old days, special island events were usually planned to coincide with the growing moon, so that folk could more easily make their way by foot to whichever venue it was planned for. Anyway, the night is still fairly calm, though a strong south-west wind is forecast for tomorrow with our weekly ferry already cancelled. What is left of a fading moon, encircled by a great halo, is shining palely in a hazy sky and the west sea is grumbling away in the distance. I have a feeling that tomorrow will not be such a good day. I’m at my keyboard again (another day) and the forecast has proved to be accurate. Strong winds are blowing from the predicted airt and rain has been coming and going in heavy showers since the early morning. Sometimes even hail has rattled the windows. How shall I cover our Harvest Home (held on November 3) I wonder, for to lose two folk of the island in the midst of such preparations has thrown a shadow upon all our activities. Already, as I write, a week has almost passed since the event in the Memorial Hall an enjoyable event, yet one has the recurring feeling that something of North Ronaldsay has slipped away. On my living room table there are two commemorative leaflets brought back from two island funerals, which took place shortly after the Harvest Home. Lesley Ann Scott, who died the day before the North Ronaldsay Harvest Home. One is for Lesley Ann Scott, born May 4, 1968 and died on November 2, the day before the Harvest Home. There was Lesley, a fighter to the last. Despite setbacks and illness that would have been a daunting challenge for the most courageous, she was determined in her own mind to get better. Even during her school days on the island and her time living at Cruesbreck (her early home) with Cathy and Sinclair and her two brothers, Michael and Graeme, she set out to master certain obstacles and later, in Kirkwall, when she so enjoyed working at Glue’s Garden Centre. There she carried out all sorts of tasks, which included not only gardening, but also visiting shops on behalf of the garden centre. Through this employment hers became a well-liked face and she was proud to live and work in Kirkwall. Lesley wanted to be independent and manage her own affairs and to follow her own ideas of living and upon that aim she focused her mind. Thirty-eight years is a short lifetime but they were years in which Lesley managed to find enjoyment and to impart some of that fun and laughter for others to remember. William Muir, who passed away aged 83. Picture Irene Cutt. The other commemorative leaflet is for William Alister Muir, Waterhouse. Born August 8, 1923 and died on November 3, just before the Harvest Home began. Willie, who, like Lesley, had had to face severe illness, pain and discomfort, also fought back with determination. He always looked forward rather than backwards. He went on after his illness, and during retirement, to carry out many renovation projects at home, and at his daughters’ houses in the south, and create some wonderful stonework round the neat and tidy home of Waterhouse. 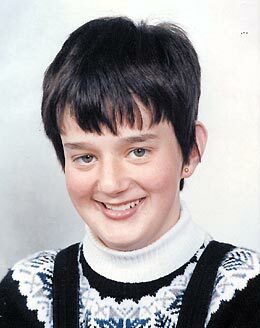 After school on the island, Willie spent a short time working at the Kirkwall Post Office. Then, in order to volunteer for the Royal Navy, he worked in Glasgow before joining as a wireless operator during the war. He was based in Ceylon, intercepting Japanese transmissions. After the war, he returned to North Ronaldsay to rebuild his parent’s home. Then he again left for the south in 1949, where, along with John Swanney, North Gravity, a fellow islander (also a wireless operator but in the RAF) he worked at the MoD wireless station in Loughborough. 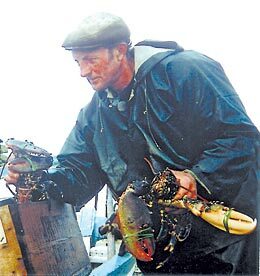 Willie came back to North Ronaldsay four years later to take over his parent’s croft, and return to his great love the sea as a very competent seaman and lobster fisherman. He married Amy Swanney and they had two daughters, Anita and Maureen. Willie served in the Coastguard, the district council and as registrar. He was familiar too as an accordion player when, along with Lottie Tulloch, they both played accordion at many an island function, and at many a Harvest Home. Both Lesley and Willie’s funerals were well attended with many friends and relatives travelling by Loganair to and from the island. The ‘Gods smiled favourably’ on those final days of parting as they did for the Harvest Home about which I will now continue. About 90 attended the event. The guest speaker this year was Richard Shearer, from the well-established shop of W. Shearer in Victoria Street, Kirkwall. He was accompanied by his wife Audrey. The association’s other guests were the Loganair pilot, Colin McAllister, his wife Jane, and daughters Mea and Rowan. The North Ronaldsay Community Association’s president, Evelyn Gray, in a welcoming speech also paid tribute to Lesley and Willie. She referred to the Old Beacon and the island’s success in reaching the final of the BBC’s Restoration Village. She acknowledged the many helpers who had made the evening possible before starting off proceedings by asking John Cutt to say the grace. The supper was as magnificent as ever. This is the part I really enjoy, with decorations, candles and old-fashioned lighting, and the anticipation of the toast to the harvest. A few intimations were made concerning progress in the Memorial Hall and prospective work planned for next year. Richard was then invited to propose the toast to the harvest. Richard, like Evelyn, paid tribute to Lesley and Willie reminding us that tonight was a time of thanksgiving for the year’s bounties and for good company and friends past and present. He referred to the 50’s TV programme The Twilight Zone which he felt one experienced tonight as the interior of old hall felt like a step back in time, and of how it reminded him of a similar war-time hall in Tankerness and great nights enjoyed there. He thought that whatever we did with the hall, we should never change the interior, which he felt had so much character and atmosphere. Richard went on to mention when he, aged 12, first visited North Ronaldsay some 40 years ago, sailing on the ss Earl Thorfinn with his father William. On that occasion, William Shearer was selling the old coir stack nets and Richard remembers their visits to the farm of Howar and the two island shops. Then, after a funny story or two, he produced, one by one, from a large bag, symbols of the old-time ‘hairst’: first the sheaf with its many uses next year’s seed, even providing a filler for the old-fashioned bed-sack, etc. Second was a coir stack net, important in the protection of the harvested stacks and a reminder of that first visit to the island, and lastly a vintage bottle of ale, another by-product of the ‘hairst’ fields. After presenting the sheaf and stack net for safe-keeping, the bottle of ale was emptied into a suitable receptacle to be sampled by the company. The speaker then asked everyone to be up-standing and to toast the Harvest Home. Martin Gray followed by proposing a toast to the Memorial Hall thus ending those pleasant proceedings. Soon the dance got under way with the local band, including Howie Firth, back once more for the Harvest Home, providing the music. During a welcome tea-break, Evelyn and Ian Deyell supervised the raffle. A great selection of kindly donated items were available, including two framed watercolours, one of which was auctioned for £330 by Richard Shearer. Total proceeds for the ongoing costs and improvements to the Memorial Hall amounted to a magnificent sum of over £600. A few more dances brought the evening almost to a close. After Auld Lang Syne, hot soup and sandwiches were served. By about three in the morning most of the company were winding their way home. By early evening the next day, after the usual lightsome tidying up, the old hall was empty and bare. One more Harvest Home joins the passage of the years but with it will always be linked the names of two, now gone, who loved North Ronaldsay. Well folks, I’ve come to the end of this letter. All day long the weather has been particularly unpleasant with gale force winds from the north-west. Showers of rain, and occasionally hail, has lashed across the island from time to time. As I write those last few lines, a tremendous west sea thunders above the sound of the wind I have just been outside. The sky has clear spaces here and there; almost luminous against menacing black cloud that seem to fly. In those few spaces, stars sparkle coldly and this year’s Harvest Home moon no longer lights the wintry sky. Today, there is a lull in the weather and it is Remembrance Sunday. At the war memorial, a well-attended short service of remembrance was conducted by John Cutt, Gerbo. At the memorial, John Tulloch, Senness, placed the Flanders Poppy Wreath. The wind was down but the sound of the tormented sea carried across the island. To the west and north heavy seas pounded the rocky shoreline and across the ‘Riff Dyke’ great waves were travelling south. I cannot resist a peedie letter at this time of year because, in the old days, “hairst” would have been in full swing across the island. Last night, in the mirking, we three travellers on the road could see the moon rising in the southern sky. “The Harvest Moon”, someone said. Well, it is indeed, as it will be full in a few days’ time and the equinox is not far away. Tonight, I have just come in from a wonderful scene. The sky is clear from east to west, with only a few dark purple clouds seen against the luminous rose-coloured afterglow of the sunset. The heat of the day, combined with the stillness of a windless night and a heavy dew, has resulted in great sweeps of mildew (a low-lying, cold, misty vapour) that, even as I write, slowly creeps across parts of the land. It creates an illusion of lakes of water, out of which the tops of houses are all that can be seen. And the moon tonight is absolutely beautiful. She is only a little more than half full and not far above the southern landscape. There she floats a bright, glowing orange, a sight that takes precedence over all else. Two years ago, I see from my diary, the last crop of oats to be grown on the island was just about to be cut by binder. September 10, 2004, was the day. One week later the stooked sheaves were built into three peedie stacks and a little “diss”. Yes, as I said last year, the moon will be sad just as I am. Not a stook or stack to remind us of those lightsome days and nights of old. What fun was often had, despite the less enjoyable days of flattened crop, broken binder sheets, sticks and stops, stooks blown hither and thither and windy, rainy days. But we always remember the good times. They remain like little jewels of the memory that come stealing upon one to enjoy and talk about from time to time, especially when the old harvest moon comes wandering round again. Since my last letter, North Ronaldsay has seldom been out of the headlines of one paper or another, with TV coverage adding to the publicity. I have been lying low – a bit like “Brer Fox” but not with quite the same intent – waiting to see what might be the outcome of such great happenings – great happenings indeed, for to have won the Scottish entry in the BBC Restoration Village is a noteworthy achievement. As readers of my letters will have surmised I am a man of old ways, old things. In my last letter I was telling you about Mungo Park, whose account of his two African expeditions I had read. This book I followed by reading Maggie Fergusson’s biography of George Mackay Brown, published earlier in the year. It is, I think, a wonderful piece of research and writing. Anyhow, in the narrative, it mentions Robert Rendall’s poem Renewal. When George was recovering from illness in hospital on one of the many occasions he had to seek medical attention, Robert came to visit in great excitement one day and he recited his newly composed poem to George. George thought it one of the best sonnets he had ever read. I’m going to finish this short letter with this poem, but first I will have a look at the night and see how things have changed . . .
As it is well past the “heuld” (midnight), only one or two house lights are left to wink in the night but the bright, sweeping beam of the New Lighthouse never stops. As it lights up the land, moving from left to right, the mildew still lies like a ghostly veil across its path, briefly glowing as the beam moves along. A few stars break up a sky now somewhat hazy and the moon has long since gone to bed. The night is absolutely still but over the air comes a faint hush from the sea and I heard, once or twice, the lonely call of my favourite bird, the lapwing. Draw breath and on life’s tree their fans unfold. Hello, it’s me again with another letter from North Ronaldsay. Since I last wrote, the island folk festival took place and it has been comprehensively covered by others in both The Orcadian and Orkney Today. When I was attending one of the events I was thinking if only all those folk present — well over 100 — were actually living on the island all our problems would be much easier to solve. Furthermore, we would have music and dancing from day-to-day and everybody would be tripping the light fantastic! As part of the decorations in the community centre over the festival period, we had on display, a small exhibition of some 20 photographs, enlarged to 12 inches by 16 inches and mounted. The theme was air travel and the first delivery of letters by airmail on July 31, in 1939, to North Ronaldsay. 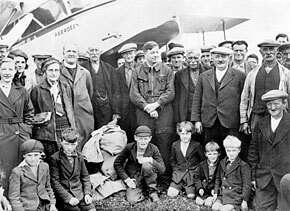 Many photographs were taken that day showing the pioneering Captain Ted Fresson OBE at the local airstrip along with islanders of all ages. I’m including one of these photographs. It comes from a fascinating collection including articles, letters etc researched and put together for the island’s archives by Beatrice Thomson, Finstown (formerly of Neven, North Ronaldsay). It’s rather amazing to think that the North Isles had a passenger service by air in 1934. In The Orcadian, dated July 26 of that year, in the intimations column, Highland Airways Ltd, announces an experimental Inter-Island Air Service, as from August 6 to operate until further notice. Flights from Kirkwall to Stronsay, Sanday, Westray and North Ronaldsay operated twice a week, on a Monday and Saturday, enabling islanders to get in to Kirkwall and back the same day with alternations in days to suit the conditions. Flight times for North Ronaldsay were: Depart Kirkwall 8.30am, arrive N.R. 8.50am and depart for Kirkwall 8.55am. Arrival time in Kirkwall was 9.20am, having also collected passengers from Stronsay. Departure time from Kirkwall back to N.R. 6.15pm, arriving 6.40pm.Those flight times gave North Ronaldsay passengers almost nine hours on the Mainland of Orkney. Fares were 15 shillings single and 30 shillings return. A complete island tour cost £3. The airmail service did not last a month as the outbreak of the Second World War, on September 3, put an end to both the passenger service and the airmail. Almost 28 years were to pass before Loganair resumed the passenger service and another four before the airmail contract was agreed. In my last letter, written around the longest day, I was saying that as the days were on the turn, better weather might be round the corner. Well, the weather has been very much kinder, with some fine days, and even with the persistence of foggy conditions lately, temperatures have been unusually high — in the 70s fahrenheit, John Cutt tells me. Indeed it has been very warm — possibly too warm at times for much excessive physical labour. At least we are not suffering the heat-wave experienced further south, on the continent, and in parts of the USA (and I’m sure elsewhere) where I think temperatures of over 125 fahrenheit were being experienced. It seems terrible to think that thousands of people — the elderly and ill — can actually die from the heat. Yesterday, I went on a little visiting spree, the day being so pleasantly warm with hardly a breath of wind. Actually, part of my visit was to check on one or two names in the photograph included with this letter. But then, apart from a ‘cuppa’ and some very good Christmas cake and shortbread, I enjoyed a tour of my host’s garden. Through the different dyked enclosures we wandered, in and out of the trees, some displaying roses, honeysuckle and the purple scented flower of, what I call, the evergreen. How very grand it is on a warm calm day to feast one’s eyes and senses on such displays — particularly the flowers with varying colours that bring pleasure at every turning. As I write, well past the ‘heuld’, an unusual moth has just appeared fluttering this way and that. I’ve never seen a white moth this size (about an inch or more wing span), with delicately orange-brown-patterned wings, indoors before. I managed to catch the creature in a glass and I must have a look in my insect book and try to identify it. In fact, the other day I saw outside a similar type of moth but larger with orange-coloured wing patterns The nearest, from memory, I thought the insect to be was a carpet moth — but then there are so many that look alike in my reference book. Another far less pleasant insect that seems to be more common for my liking this summer (it must be the warm weather) is the biting cleg fly. One only becomes aware of this menacing, ugly, grey-coloured fly when the typical needle prick attack is felt — sometimes even through one’s shirt or trousers. It has the impudence to comfortably fold back its wings (well, that is what it does) intending to settle down for its vampirish meal. Each one who attacks me dies swiftly with as fast a hand movement as I can manage, but it leaves its poison to itch for days. Some folk, I may say, react very badly to the creature’s bite. This will never do as I see it is coming on for two in the morning. I must away to bed and read at least another chapter of my latest book, Travels in Africa by Mungo Park — so much do I look forward to this fascinating account that even at this late hour I must read a bit more. I’ll finish my letter tomorrow. Here I am again — not such a good day so far, grey skies and a breeze of wind but still warm, and on the lee side of the ‘hoose’ where the fuchsia and honeysuckle grow in great profusion (no I don’t have a beautiful garden) bluebottles and hover flies are buzzing away, and I’ve just seen a magnificent red admiral butterfly. Thinking for a moment about Mungo Park when he was exploring West Africa in 1795 — in areas now known as Senegambia, the French Sudan, Niger Colony, Dahomey and northern Nigeria — he experienced real hardship, disease and danger. At one time he was imprisoned by a native chieftain, escaping with only his horse and a compass. But I must tell you about an episode that took place during the explorer’s return journey from his first explorative venture (he made two). It caught my imagination and reminded me of the story of Robert the Bruce when hiding in a cave and of how, when his spirits were at a very low ebb, he was inspired to fight on when he saw the determination of the spider. On Park’s return journey, he was captured by robbers, stripped naked, with his horse, belongings and compass taken. He was finally left, with minimal clothing in (as he says) “a vast wilderness in the depth of the rainy season, naked and alone; surrounded by savage animals and men still more savage and five hundred miles from the nearest European settlement”. At this point his spirits began to fail and he resigned himself to certain death. In this state of total despair he saw a small moss, not larger than the top of one of his fingers. It was, he says, of the most extraordinary beauty that he could not fail but admire this creation in such an obscure part of the world. He mentions this, at the time, trifling circumstance, and how the mind will sometimes derive consolation when in a state of absolute dispair. He thought if that Being (meaning God) can create such a thing of beauty in such a place, surely he could not look without concern upon his own devastating circumstances. Disregarding both hunger and fatigue he started up and travelled forward assured that relief was at hand. Well, Mungo Park survived, but on his second journey (1805-1806) to Africa to further explore the Niger he was drowned in this river during a clash with hostile natives. He was only 35. As I’ve been writing, the day has improved, and now the sun is high in a hazy sky, though a fair wind is blowing from the southeast and I think change is in the air. Oh, by the way, the moth I caught was, I’m sure, a magpie moth. Anyway, I don’t think I should write much more except to maybe mention one other inspiring tale. Among former art school students of my acquaintance, there is one colleague in England who receives kidney dialysis three times a week. She has one day clear between treatments with Saturday and Sunday also clear. After each session (which takes three hours) the following day, when she is at home, she feels nauseous, tired and unwell. Almost the only day that brings some feeling of normality is a Sunday. Yet, when I speak with her, she is so very cheerful and full of apologies for her condition and letting us (former colleagues) down by being unable to keep up her side of the work we all trained for. But she is determined, with something of the same iron-will shown by those two great men mentioned above, to fly up to Aberdeen to meet once more for a re-union with those of us who are left, and who, 45 years ago, worked together and had much fun learning our trade. Let us think for a moment about Robert the Bruce and Mungo Park and the former art school colleague. When the struggle appears to be lost and when individuals are faced with seemingly insurmountable odds or suffer ill-health, it seems there is something in the human spirit that transcends all of this and gives us hope and courage to face another day. In the not too distant past in Orkney, great fun was had at midsummer (though of course there were serious reasons for marking the occasion). As has been mentioned before, it was one of the four times during the year (Yule, Beltane, Midsummer and Hallowmas) when bonfires were lit. Ernest Marwick describes the celebration, as does John Firth, writing in more detail at the end of the 19th century. Well, the other night, midsummer’s night, I received a phone call. The question was: “How about dancing round the Standing Stone?” I’m always game for such occasions. Because of the lateness of the idea, only a few managed this bit of mid-summer madness, as some might call it. Nevertheless, part of an eightsome reel, a waltz, one-step and an Eva-Three-Step were managed with appropriate music. The Famous Grouse crowned the occasion. Let’s hope that the next half of the summer will be better than the first, now, as they say, that the days are on the turn. Fairly recently I spent a day in Kirkwall. As my fellow passengers and I flew to the Orkney Mainland with Loganair, the islands below looked green and peaceful in the morning sun. I was day-dreaming for a bit as we flew and thinking of how some centuries before I would have seen a few Norse settlements scattered here and there, and possibly a Viking longship or two sailing between the islands. So there I was flying, literally through time in one sense, but backwards in time in my imagination in another. But more of my Kirkwall visit in a moment. Yesterday was a splendid day, fresh and sunny with a tingling westerly wind. It was also the school’s open day. As always there was a good attendance. The pupils’ work was on display, extending from the classroom through to the main hall. The term’s project had been — funnily enough for me and my day-dreaming – the Vikings. Pupils and staff were dressed in Viking costume and looked very authentic indeed – even the boys with their helmets and swords had leg-bands dyed yellow with the dandelion, one of the various plants used for dying wool in those days. A huge model of a Viking longship some nine or ten feet long with mast, sail, shields etc, dominated the classroom. Quite good directives for any individual today I think – very desirable, in fact, for any community. Heather Woodbridge, Duncan Gray, Cameron Gray and Gavin Woodbridge had, among other exercises, each written an imaginative story. They had also, I was told, as part of their project (during term) individually given a talk on the Vikings. During the afternoon they manned money-raising stands and were available to talk about their work. Even Ronan Gray, nursery pupil, standing at a mural illustrating some of his activities, was ready to answer questions. Incidentally, the sum raised for school funds was over £100. After the veritable feast that followed the exhibition tour – including, by the way, some Viking-type bread baked by the pupils – the new head teacher, Susan Gilbert, thanked everybody for attending. Prizes were presented to winners of the various competitions, bringing the enjoyable afternoon almost to a close. Although a week or two remains of the term, this open day will be the last for Heather Woodbridge, who completes her time at the North Ronaldsay school and moves on to secondary education. Folk lingered at tables discoursing for a bit longer, so pleasant are those open days. At my table there were some senior islanders and we talked a little about old times. Of how much harder the work was in the 20s and 30s. Two of my companions were 85 and in good fettle; another was almost 80. We agreed that, generally speaking, “folk nowadays didn’t know they were living” – a saying often quoted by a generation who really had very little, and had to work hard in a much more physical way than we do today. Well, as they said, there was the cutting of the crop by scythe, the gathering of scythe-cut oats or corn by hand and making into sheaves. Before tractor power, three horses pulled the binder (binders were generally in use by the 30s) though the roads giving access to the fields for cutting still had to be managed by scythe and hand. How an insurance stamp had to be paid for. How folk from smaller crofts on the island were sometimes employed by those with more land who required help. Many islanders, mostly young men, travelled to other neighbouring islands, and to the Orkney Mainland, to work for a hairst on big farms. Life was without question much harder in those days, with any additional wages sought after almost out of necessity. Think, for example, about the number of animals some small crofts could support – maybe as few as one cow and one calf with last year’s calf sold in the spring. Many others on the island might have had three cows and three calves. Larger crofts could boast more like six cows. There was, in addition, the fishing and, importantly, the native sheep providing wool and meat, with each owner allowed a certain number according to their entitlement. That regulation, of course, is still very relevant with regard to common grazings. Any great deviation from those old rules, laid down by our forebears, would mean too many animals on the foreshore (in the case of North Ronaldsay). In the Fair Isle, all sheep owners – one of whom I spoke to recently – adhere strictly to their allocation. Otherwise, in a common grazing, as the crofter rightly said, everybody’s animals suffer unfairly in one degree or another. In fact my contact with our Fair Isle neighbour was most interesting and very enlightening, but that is another story. Now I am back to my trip to Kirkwall. If I have a bit of spare time, as I did on that occasion, I mostly try to fit in a visit to the cathedral. It really is a magnificent building and one can never tire of walking through its great corridors. 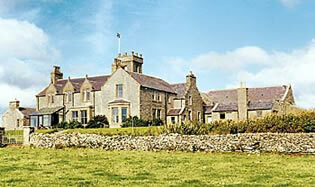 Another building which I try to get to is the Tankerness House Museum or as it is now called, the Orkney Museum. This summer there is a splendid exhibition with many fascinating items on view called The Victorians: The Empire Builders. Of much interest is the comparison between what was happening (broadly speaking) in the industrial cities of northern Britain and in Orkney. It is those changing exhibitions that I try to see from time-to-time. Mostly my visits are confined to between planes on the one day. However, on this occasion I had ample time and my footsteps took me into the other rooms that tell the story of Orkney, beginning with the Stone Age. This is an area where I have not had a chance to spend much time lately. Imagine my surprise at discovering how extensive the rooms and exhibits have become. Now there are new galleries on the Medieval periods and even more rooms devoted to the 19th and 20th centuries, bringing Orkney’s history up to the present day. Those later additions, completed in 2003, marked the culmination of former curator of the museum, Bryce Wilson’s, long years of dedicated work, along with his staff, of bringing everything up to date with presentations that are truly magnificent. There, for an hour or more, one can become, so to speak, a traveller in time — almost like my day-dreaming on the Loganair plane. But in the museum there are the actual artefacts of some 5,000 years of Orkney’s history to see. How wonderful it is for Orcadians and visitors alike to have such a fine museum to see and enjoy. Time now to bring this letter to a close. I’ve been tapping away for hours on my computer, feeling rather guilty about this sort of activity on such a good working day. Earlier, the weather was beautiful with bright sunshine and a fresh southwesterly wind that made the tall lupins at the front of the house dance and swing. The sea was a very deep blue speckled with white. It was the sort of day that it would have been a great pleasure to ride the waves in our old praam with the salt-spray flying. Skylarks were singing and buttercups shone yellow in the sun. When I was out a moment ago the changing night has left the sky cloudy and grey. Two lonely gulls flew past banking in the fresh wind, and in the west the last vestiges of a midsummer sunset coloured the sky orange between the grey clouds and the darkening sea.